In June 1991, one of the largest volcanic eruptions of the century happened in the Philippines, about 100 kilometers north of Manila. A few hundred people were killed and hundreds of thousand people rendered homeless, mostly Aeta people (the aborigines who call the mountain "Apo Malyari (The Great Provider)" and believe the mountain is home to spirits). The death toll could've been much more if then Philippine Institute of Seismology and Volcanology (Philvocs) weren't able to persuade people living around the volcano including the Americans to vacate the area. The Americans, then still occupying Clark Airbase, were driven out. The big explosion occurred on June 15 where large volumes of sulfur, volcanic ash and other gases that cooled world temperatures for a few years. The situation was worsened by a tropical deppression present in the area turning ashes on the slopes into rampaging and deadly lahar. I was in Manila at that time, and I can still remember how the sky transformed from sunny to dark and gloomy with portent of things to come. The following day, volcanic ash from Pinatubo covered the big Manila making it look like a giant "espasol" (can't help the comparison, I love that rice flour-covered sweet Filipino delicacy). Having learned of a friend's intention on scaling the mountain to reach the crater, I instantly made arrangements for the trip, not actually a mountaineer, that I bought a 50 liter backpack in Landmark, Bombproof gear trekking pants in Robinsons Galleria, sleeping bag and earth mat at a certain Buendia mountaineering shop in Makati, to equip the tutubi for the overnight trip to the once angry crater. Meeting with the group at Chowking, EDSA Central, we boarded a van chartered by our guides and headed to North Luzon Expressway (NLEX) exiting Dau toll plaza, passed by O'Donnell and ended in Sta. Juliana, Capas town in Tarlac province. In Capas town, our guides negotiated for us to board 4x4 vehicles that took us to the jump-off point of the trail, traversing miles and miles of volcanic sand offering glimpses on the destruction wrought by the gargantuan explosion that ravaged thousands of hectares of rice fields and forests turning them into sand deserts. The bumpy ride with numerous stream crossings took about an hour. Loading our heavy backpacks, loaded with clothes, sleeping bags, earth mat, tent, food, water, and other things needed to survive this "sad fate," we ourselves asked for, was quite easy. Bringing them all the way to our destination was another thing. 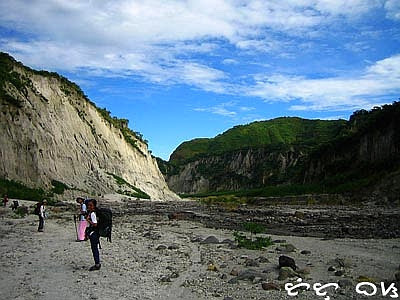 The trail is just sand, sand and sand through valleys created by the rampage of Pinatubo aided by typhoons that helped carved the geologic beauty. Stream crossings avoiding slippery rocks. I wore my usual open sandals that's why I can get my feet wet. It's also a good thing it's partly cloudy. The trek is called to a stop for short water breaks, comfort breaks, lunch, or when someone's too far back. A leader, "middleman," and a sweeper composed our guides and made sure we're all accounted for. 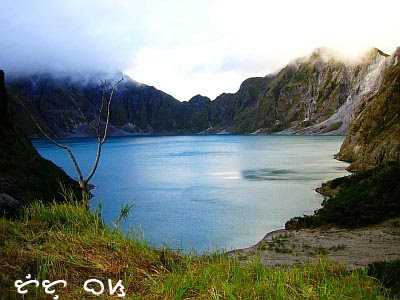 Pinatubo crater, at first sight: We're not alone! The guides immediately brought out their rappelling equipment for us to rappel down the crater lake on a cliff. This took a long time and I gave way for the ladies to rappel down first so I just did what i like best: descend on the lake taking pictures along the way. Down the lake, our guides inflated their kayak. It was I who first dipped into the water even tried to taste how the water tasted like to satisfy the curiosity of the tutubi: it's just like ordinary fresh water, even odorless without any tinge of sulfur. But it's also like swimming in salt water where I floated effortlessly. There's also the added bonus of bathing in sulfur-soaked water without paying an arm and a leg at the nearby Pinatubo Spa where they smother their guests with volcanic sand to achieve their claimed therapeutic properties. At sundown, we pitched our tents on the roofed portion of the place (Capas local government also provided toilets to the place sans running water. We had to fetch water from the nearby waterfall) and prepared dinner mostly packed or canned goods strictly observed no trash to be left behind. Early in the morning, I decided to get up to catch the early morning light to light up my photographic subject: Pinatubo crater at its serene best! There's life in Pinatubo: one of the best in my portfolio (as if I have one) that I sometimes print to a large size and give to my friends. The return trip to the point where we boarded the 4x4 anew took only ninety minutes against 3 hours on the ascent. Big smiles can be seen from our faces, even if exhausted and sunburned, knowing we earned the bragging rights to proudly say: we survived Pinatubo! 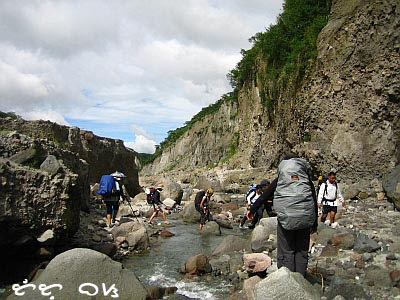 Pinatubo crater can also be reached via a more difficult trail in Porac, Pampanga suited for the people looking for more difficult challenge. Mt. 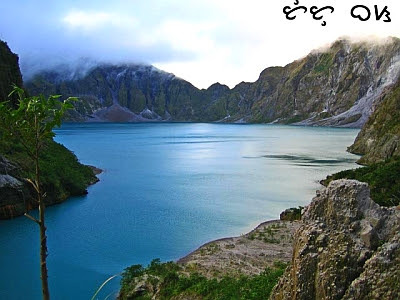 Pinatubo i located at the boundary of the three provinces of Tarlac, Pampanga and Zambales in Central Luzon. From Manila, take the North Luzon Expressway; exit Dau Toll Plaza; take north-bound MacArthur Highway. Upon reaching town market in Capas, Tarlac, turn left to Bgy. Sto. Rosario; proceed to Bgy. Sta. Juliana. Register with local officials and 4x4 jeep. 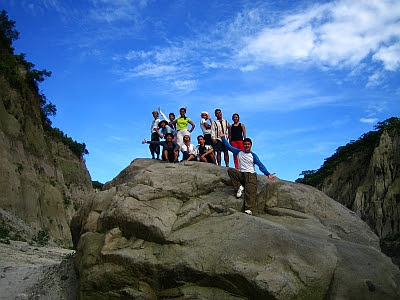 Costs: 4x4 jeep PhP3,500.00 (3-4 persons), guide PhP500 (per 5 persons). 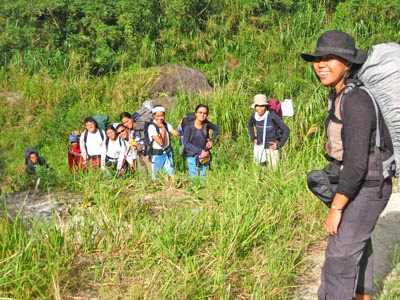 Sounds like a big challenge to climb Mount Pinatubo! Mt. Pinatubo is still active, isn't it? i just hope mt.pinatubo wouldn't cause too much destruction again. so much has changed since the explosion. its always good that life and greenery has come back. sayang, di ko pa napupuntahan to pero there is always time. hi! 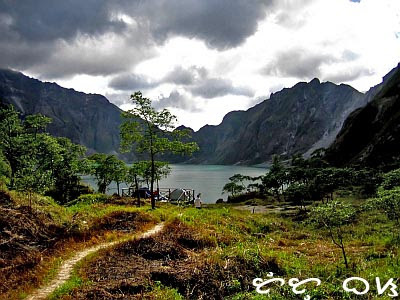 i've always wanted to trek pinatubo crater, and taal as well. can you please share the expected expenses if one is planning to go there? thanks! Nakupo. I was searching for a Pinatubo dusk/dawn pic a few weeks before for an Intl publication, dapat pala sayo ako humingi. wow turqouise waters! pwede bang mamingwit ng isda diyan? i am from tarlac and with some luck, our town was spared from the lahar flow, but we heard a loud bang, then the earth shook, and before we knew it ash was coming down pretty fast and pretty heavily. when all settled, our roofs are heavy with ash, it was a sight not to be erased from our memory forever. we did receive group counselling after that, and our school started a massive fundraising campaign. we delivered this to capas, concepcion, and bamban. i regret not keeping a diary of that period, but it was nice to know that the once agricultural land has transformed into an adventure locale. thanks for thi post. wow! ang ganda nga ng kinalabasan ng malupit na Mt. Pinatubo noon. grabe! tutubi! i really like how your photos gave justice to pinatubo's beauty. we went there too, last feb. and even to date, im still raving how splendid my experience was. too bad, my shoddy hands fell short to capture its beauty in photography :-) but yours are just perfect. galing mo! Sana naman I also get a chance to visit that lake someday. It looks absolutely gorgeous from your photos. Glad you and your group had a great time! Your vivid recounting compliments well your enviable pictures. I wish I'll have the time and opportunity to visit Apo M. before it rises up again. Sleep sounder and longer, crater. Oh my goodness! Your photos are so beautiful. Madami na pala nagt-trek ng Pinatubo. I can't imagine how somethine so beautiful could be so destructive. That must really be how nature works. I remember 1991 when the skies turned dark in Manila. It was really horrifying... parang end of the world na. I still recall the time when Pinatubo just exploded and I was at the NAIA airport flying back and was concerned that they would prevent planes from flying due to the ashes. Sino po guide nyo sa pinatubo? I've been wanting to this since last year. Hope I will do it this December at may mabully akong kaibigan na sumama sa akin...just a question, do you need to book/arrange for the 4x4 jeep and guide in advance? wow! 20 yrs na pala. last yr ko lng napuntahan ang Mt. Pinatubo at my cemented walk way na xa, unlike before,. love the pix! never ko pa xa nakita na ganyang ka bluegreenish. inggit! I want to ask if its okey to the locals not to rent a 4x4 wheels. I think it is a bit expensive cause I am trekking the place alone. Solo backpacking. Thanks. 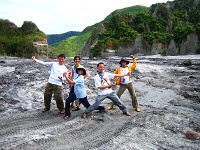 hi, me and my friends would like to climb mt.pinatubo and stay there for a night. Do you think you can give me your contact person that can help us in going there? thanks a bunch! my email add is efrelyn23@yahoo.com. One more thing, how much does it cost per person? thanks a bunch! Nakakamangha that after such massive destruction eto na sya ngayon - sobrang ganda na ng Mt. Pinatubo.